As with every project sewing corporate profits to politicians with the thread of government approval, the Dakota Access Pipeline didn’t come to fruition as a simple sign-on-the-dotted-line business arrangement. Mobilizing militarized police to a prayer gathering and deploying of mercenaries to sic vicious dogs on unarmed Native Americans attempting to protect land and water from sullying by Big Oil and Gas, for all intents and purposes, appeared at best disproportionately excessive. But on closer inspection, as ReverbPress reported, the nearly inscrutable web of corporate and political interests backing the project — and the years of cunning forethought they undertook to ensure its implementation — make the Dakota Access Pipeline one of the more devious usurpations of fundamental rights to date. As intended from inception, Energy Transfer Partners’ hydrocarbon gem opened floodgates for Big Oil’s unrefined crude to effect a mass exodus to nations far and wide. Put simply, the legislative legerdemain allowing ETP’s export of unrefined crude to foreign nations also permits any other oil and gas company with any pipeline project to repeat the process — and the possibility of tantalizing profits virtually guarantees the violence wrought upon water protectors of the Standing Rock Sioux will visit other Native American nations and residents unfortunately positioned in future pipelines’ paths. So, how did this happen? In part, through bait-and-switch by semantic deception. Energy Transfer Partners presented its case for construction of the 1,172-mile Dakota Access Pipeline — which would traverse North and South Dakota, Iowa, and end at a hub in southern Illinois — in 2014, listing multiple rosy benefits, from decreased transport of crude by rail and truck, to “an estimated $1 billion in direct spending to the U.S. economy.” In fact, the company cited a lofty goal to decrease American dependence on foreign product. Implied, of course, are the profound impacts Dakota Access would have on reliance on foreign oil, because — once operational — crude pulled from beneath the U.S. would remain in the U.S. A true example of American pride in oil and gas assets, indeed. Except it wasn’t — and was never intended to be. Energy Transfer Partners — a company notorious for cutting corners for money’s sake, poor maintenance, and resultant leaks and spills — sought the profits of foreign, not domestic, markets. But at the time it was announced, a federal law in place for four decades prohibited the export of any unrefined crude — for instance, North Dakota’s Bakken light, sweet crude — the type slated to flow through the Dakota Access Pipeline upon completion, forecast for the last quarter of 2016. For ETP, the enormous, if relatively fleeting, profits at stake meant the well-established 1975 ban on exporting crude plundered from reserves beneath the United States presented a nasty obstacle — but company head, Texas billionaire Kelcy Warren, has friends capable of pulling even the most taut strings. Except, Perry did have a keen personal interest from which he could expect a handsome financial windfall. And ETP’s assurance no ‘understandings’ existed between the company and the former Texas governor — in a federal document intended to prevent political favors for corporations and vice versa — constituted a bold-faced whopper of a lie. Although it could be argued the Big Oil Texan’s support of a highly-profitable pipeline was to be expected, his board appointment the following day and several other factors make any coincidence moot. Dallas-based Energy Transfer Partners CEO and chairman Kelcy Warren has supported Perry’s political career for years, contributing massive amounts to his political campaigns both in personal donations, and through various super PACs. However, prior to Perry’s bid for the presidency this time around, Warren — worth $6.7 billion, according to Forbes — had only contributed relatively meager amounts, giving just $250,000 to the Texan’s 2012 presidential super PAC. In 2015, Perry raised eyebrows by kicking off his presidential campaign while failing to resign from ETP’s board, as would be de rigueur for candidates ensuring constituents no conflicts of interest would arise between their private and public lives. Incidentally, and also while Perry remained on the board of directors, Warren — working as the candidate’s campaign finance chairman — contributed an astonishing $6 million to the candidate’s campaign super PACs. In addition to these telling financial points, further evidence eviscerates Energy Transfer Partners’ claims of impartiality and lack of conflict in the ‘fortuitous’ appointment of Perry to the board. Aside from the former governor’s gaffe advocating for the Bakken Pipeline one day before landing a spot on the company’s board, just one month after Perry took that position, he began lobbying for a piece of legislation stuffed with a rider essential to ETP’s ultimate goals concerning Dakota Access. Sponsored by House Republican Charlie Dent, H.R. 2029 — known officially as the Consolidated Appropriations Act, 2016, and unofficially as the behemoth omnibus spending bill — spanned almost 900 pages of text stuffed to the gills with wholly unrelated items. With so many riders, and an impending government shutdown making time of the essence in its passage, it would have been all-but impossible for politicians voting on it, to peruse its entire text. But Perry, on ETP’s board, and Dent, again, the bill’s sponsor, grasped the auspicious opportunity the volume of the legislation and its critical deadline presented — and took full advantage. 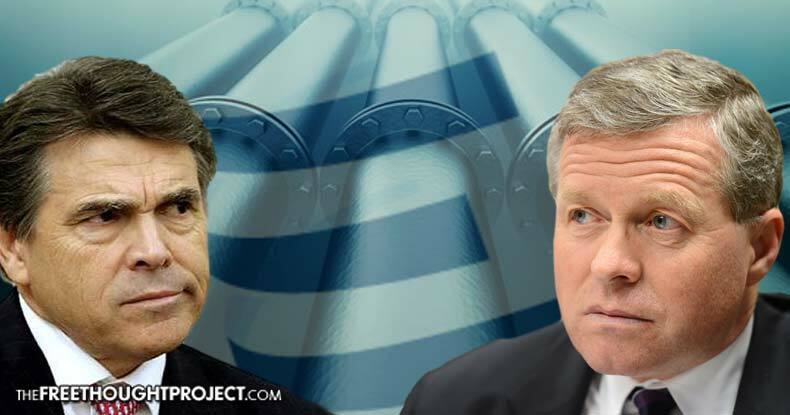 Incidentally, one of Charles Wieder (Charlie) Dent’s biggest contributors in 2014 and 2016 was the mammoth German chemical company BASF SE, according to OpenSecrets.org — and BASF’s financial advisor is none other than Deutsche Bank, which happens to have well over $275 billion invested in the Dakota Access Pipeline. With these political, financial, and corporate interests in mind, Section 101 of the omnibus H.R. 2029 sought to lift the ban on U.S. exports of unrefined crude if the legislation passed — which it did in December 2015. This bait-and-switch from domestic to foreign crude interests was, sadly, expected by property owners, residents, and Native Americans in the pipeline’s nearly inevitable path. Although attention has largely focused on the controversial handling of encamped Native American water protectors and activists attempting to halt construction on the North Dakota section of the pipeline, no less contention surrounds its plans in Iowa. Gov. Terry Branstad, a long-time friend of Rick Perry, granted Energy Transfer Partners the power of eminent domain through its request to the Iowa Utilities Board — giving the for-profit, private corporation governmental permission to usurp Iowans’ private property. A number of lawsuits over the Big Oil land grab are now pending in courts along the pipeline’s route, as they are in other states where the contentious eminent domain powers have been enacted. Branstad, like his good buddy Perry, isn’t lacking personal connections to ETP, himself. Shortly before ETP appointed Perry to its board of directors, the company hired Jeff Boeyink — Branstad’s former chief of staff, close confidant, and loyal ally — as a paid lobbyist on January 5, 2015, DeSmog found. Just two days later, Branstad railed against state Legislature meddling in decisions regarding the pipeline. As governor, Branstad appoints members to the aforementioned Iowa Utilities Board — the entity granting ETP’s request for powers of eminent domain — and, according to the Des Moines Register, “warned against ‘political interference’ into the administrative review process” regarding the Bakken pipeline. ‘Follow the money and all will be revealed,’ has been the working paradigm for muckrakers, truth seekers, and corruption-busters for time immemorial — and the Dakota Access Pipeline clearly does not deviate from this necessity. But while the peoples native to this land valiantly and defiantly oppose yet more exploitation, the corporate, banking, and government goliaths backing the potentially devastating project almost certainly view their efforts as little more than a nuisance to be dealt with before billions in profit flow through the pipeline.